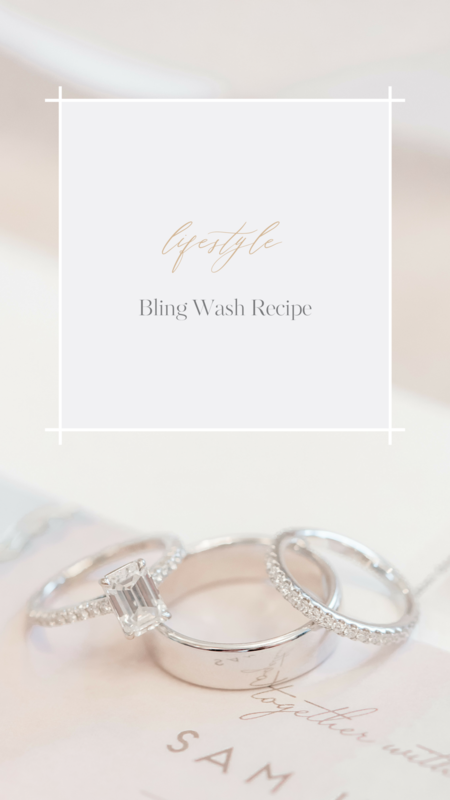 We came across a ring wash recipe from local designer, Kaitlyn Harris originally found from Living with Landyn and let me tell you, this recipe is magic! Seriously it blew our mind how clean our rings came out after following the recipe to a tee! Fill a microwave dish with roughly two-cups of Windex. Add a few drops of dish soap. Without a lid, microwave the solution for one-minute without your jewelry inside. Remove and add your rings and allow to soak. I left my rings in for about 10 minutes then gave them a scrub with the toothbrush, rinsed with warm running water then dry with a paper towel. When removing your rings to scrub after soaking time, use a tool to remove from the solution. A fork or any tool will work to do so. When you are rinsing your rings under warm water, they are a little slippery so please take caution with placing over a bowl in the sink or plugging the sink prior. As Living with Landyn mentions, this recipe is recommended for real diamonds, gold, and platinum metals. Once I made the recipe in a microwavable dish, I saved it for future aka weekly cleans and would re-heat it. Let us know your thoughts on this miracle bling wash!